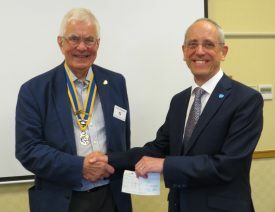 Speaker Malcolm Rolfe told the Rotary Club of Warwick this week about the work of the charity Hope and Homes for Children which works to get children out of orphanages and into proper homes. Hope and Homes for Children was established by Mark and Caroline Cook who responded to the plight of orphaned children in Sarajevo during the Bosnian war. At first they planned to improve the terrible conditions they found in the orphanages, but soon came to understand that what the children needed was a home with “love” in it. Today, the organisation that started at their kitchen table in Wiltshire in 1994, is at the forefront of a growing global movement to eradicate the institutional care of children. Worldwide there are 8 million children in orphanages, but 80% are not actually orphans but have been abandoned, or worse, taken by the state to live in an institutions due to disability or poverty. Living without anyone caring for them, disables their development and leaves young people struggling to cope when they leave the institution, liable to fall into prostitution, crime or commit suicide. Closing the institutions and supporting families to look after children is cost effective for society as well as plain sense. The charity works across the countries of eastern Europe as well as Africa and is a global expert in the field of finding alternatives to institutions. Working with Rotary in Romania “Unlocking Futures” is now close to closing all their orphanages and has become best practice here and in Rwanda. These lessons have been adopted by Unicef and taken around the world. By closing institutions, supporting children into loving, stable families and working with governments to tackle the root causes of family breakdown, they are working towards a day where orphanages have been eradicated for good. Thanking for his presentation Rotarian John Taylor said that Rotary Shoebox had been sending support to Eastern European children for many years and would continue to do so. Members were pleased to hear of the progress being made and President John Hibben then presented Malcolm with a cheque to fund their work. Hope and Homes for Children has a website www.hopenandhomes.org where you can find out more.